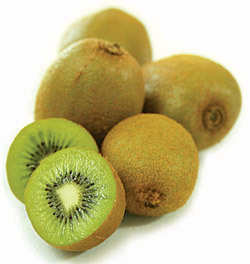 Kiwifruit is loaded with flavonoid antioxidants and enzymes. It contains vitamin A, vitamin C, vitamin E, vitamin K, choline, potassium, phosphorus, iron, calcium, magnesium, copper, zinc, and so on. The black seeds in the fruit are packed with omega 3 fatty acid. Apart from consuming this delicious fruit, you can also apply it on your skin to derive its beauty benefits like getting rid of excess oil, tightening large skin pores, fading dark spots, brightening dull skin, reducing wrinkles, etc. It helps slow down the effects of aging. The simplest way to incorporate kiwi in your beauty regime is to peel the skin of a couple of kiwis, chop the fruit into small pieces, and mash it or blend it in a blender. Apply this paste on face and neck, and rinse it off after 10-15 minutes to nourish your skin and remove the impurities. • Kiwifruit can be used on dry skin by applying a combination of an egg yolk, and one tablespoon each of kiwi juice and extra-virgin olive oil. Leave the mask on your skin for about 15 minutes and then remove it. In case you have oily skin then apply a blended mixture of kiwi fruit, plain yogurt, skim milk, organic honey, ground oatmeal, and a drop of lavender and sandalwood, grapefruit, geranium, and tea tree oil. • Put one kiwifruit, half a banana, and two tablespoons of plain yogurt in an electric blender or food processor and turn it on. Use the resultant smooth paste on your skin for about 15-20 minutes and then, wash it off with warm water, followed by a toner and moisturizer. Regular application of this homemade beauty recipe helps maintain soft, smooth skin, cure blemishes, and prevents wrinkles. Here’s a video showing how to make a skin brightening face mask with kiwifruit. • Prepare a face mask by blending a cup of boiled carrots, one kiwi, two tablespoons of plain yogurt, and tablespoon each of sweet almond oil and lemon juice. This skin-care recipe is suitable for all skin types. • Make a natural toner for skin by pouring a cup of hot water over mashed kiwifruit in a bowl. When the solution cools, strain the fluid and discard the pulp. Finally, add a tablespoon of vodka in it and mix thoroughly. You can store this homemade skin toner in the refrigerator up to 10 days. • You can also make a refreshing and exfoliating recipe at home by blending together one kiwifruit, five strawberries, and half a cucumber. If the resultant mixture becomes watery, you may add a teaspoon of oatmeal in it. • Another beauty recipe to exfoliate your skin involves a mixture of mashed kiwifruit, half a cup of sea salt, two tablespoons each of chopped mint leaves, almond oil, and one-eighth teaspoon of grapefruit seed extract. If you have sensitive skin, then replace the sea salt with sugar granules. • To make a homemade facial cleanser, blend a kiwi in a blender to get a liquid puree of the fruit. Next, mix two tablespoons of plain yogurt, one tablespoon each of almond oil, honey, orange water, a teaspoon of finely ground almonds, and two drops of orange essential oil. Massage this cleanser gently on your face and neck to rejuvenate your skin and get rid of acne. • When dealing with problems such as eczema, psoriasis, dry, cracked skin, etc., you can apply kiwi seed oil. This moisturizing oil works as a natural emollient and helps restore skin’s elasticity. Regular intake kiwifruit is good for cardiovascular health, protects against age-related macular degeneration, and prevents coughing and wheezing, particularly in children. Plus, being rich in dietary fiber, it works a bulk laxative and helps control blood sugar levels. Thanks for sharing. Homemade facial masks provide essential nutrients to dull, lifeless, and aging skin by using ingredients easily available at home.